White Birch Vineyards welcomes Bre Van Vort, who was born and raised in Santa Barbara in the heart of the Central Coast Wine Country. She brings knowledge and experience from both the West Coast & East Coast wine regions. Working at large scale and boutique wineries in CA and helped build a Brand, Sales & Wine Club in Connecticut. Getting started in the wine industry first in the Santa Rite Hills AVA at Babcock Winery & Vineyards. Working with Bryan Babcock who was named "James Beard Top Ten Winemakers in the Word" taught her a lot about terroir, revolutionary farming and her passion for wine and sales. 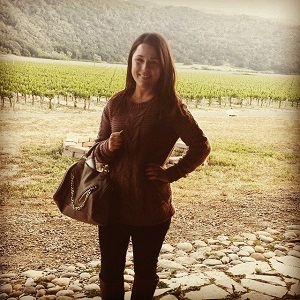 After getting a great grasp of the wine industry she was promoted to Events Coordinator at Koehler Winery & Vineyards in the Santa Ynez Valley AVA. But being married to a winemaker and a passion for travel ended up bringing her and her husband to the East Coast where they "teamed up" at Priam Vineyards in Connecticut. Making a great team they won "Winery of the Year" from NY International and also winning Bronze & Gold Medals for their wines in a handful of international competitions. Bre is very excited to bring new ideas and events to the White Birch Vineyards Tasting Room and to learn more about Finger Lakes Wines to share all of her knowledge with our wonderful customers. Check back to see Bre's routine blogs - bringing you new and exciting information on the tasting room, events, and wines of White Birch. The fruit used for wine is left on the vine until maximum sugar is accumulated to produce wine with a significant amount of alcohol. Birds, wasps, and foxes are just a few creatures attracted to the ripening fruit hanging in the vine. There are a few different ways of repelling the predators that consume the fruits of our labors. The best way is exclusion or a barrier blocking access to the fruit. This is the only guaranteed way to get as much clean fruit to the press as possible. When the fruit gets damaged it opens it up to bacteria and fungus which will make it unusable. Bird netting over the row is the common method of protection against the major source of fruit looting in our area. 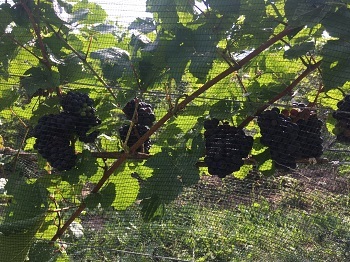 The picture is of our Pinot Noir protected by the nets. The downfall with netting is the time to install and uninstall. We also use reflective tape, pinwheels, and a speaker system that plays sounds of eagles and falcons along with sounds of common fruit-eating birds in distress. In the next blog we will look into the measuring of sugar and how well we are keeping the fruit intact on the vine. The onset of “Ripening” begins the plant’s final push to make the fruit attractive and tasty so the fruit gets consumed; resulting in the seeds being left in a nice pile of fertilizer. The picture shows clusters of Cabernet Franc going through what the French call “veraison” or the onset of ripening. Fruit that produces red wine starts out as green berries that change color during veraison. Cabernet Franc ripens quite late in cool climate growing regions, resulting in it being the last of our varieties to hit the press. 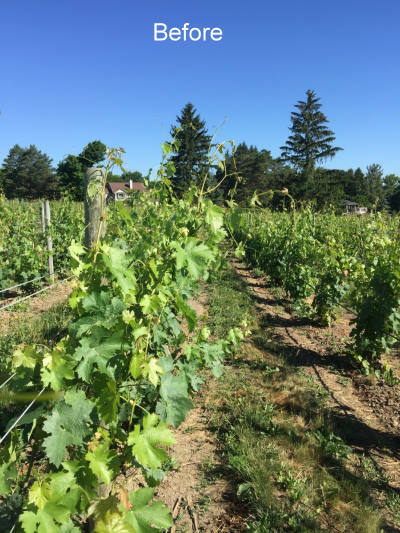 Our winemaker says that the Cabernet Franc and Cabernet Sauvignon are among the grapes that are picked last in the Finger Lakes; picking is usually the middle to end of October. Depending on the growing season, the fruit could hang until early November. 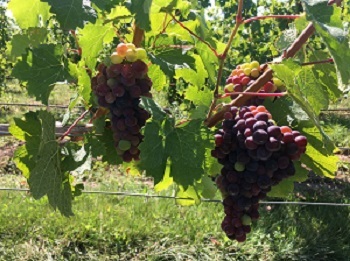 Green fruit during veraison turns translucent and the berries soften up as they swell with sugar. The sugar that gets consumed by yeast to produce alcohol to make wine is also attractive to just about everything else. More on that subject in the next blog entry. We got about a half inch of rain which is not enough to get us out of the drought conditions. One thing the rain does do is help the vines grow. 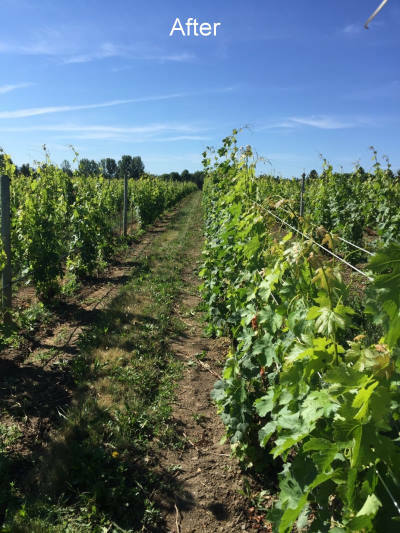 When the shoots get too tall and lean over the row middle it can shade the fruit zone and restrict the air that flows around the berries and leaves. Air flow is the best way to keep the berries and leaves healthy through the season. The mechanical hedger uses six spinning blades to chop the top and sides of the canopy to a nice uniform “Hedge”. 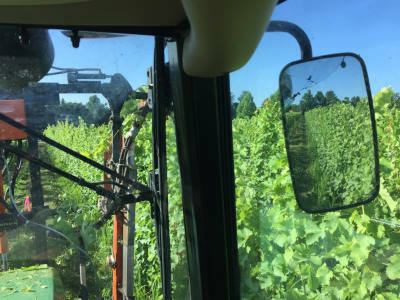 In the picture above you can see in front of the tractor the shoots are still untouched while the side view mirror shows the nice straight line from trimming. Depending on the season we probably will have to make another pass through the vineyard with the hedger. The picture below explains the lapse in blog posts. The week mentioned in the previous post turned into a month. The early shoot growth stage starts off at a very vigorous pace which is hard to keep up with. At this point of the season we have gone through bloom and fruit set. The weather has been dry and warm over the last month making the conditions for bloom and fruit set perfect. With the weeks of warm weather and very little rain we now have to monitor the vines for signs of drought stress. The forecast shows a chance this weekend; all we can do is hope for a bit of rain.